Chess is an interesting game for all ages. Children, adolescent and people mostly like to play chess in holiday.They can play it indoor and outdoor. Otherwise, have outdoor chess game is more interesting and challenging. Beside play game, you can enjoy free air in environment arround. To support the outdoor game, you may need giant chess set. By this kind of chess set, sure your game will more interesting and challenging. In the picture above, we show you about one of our giant chess collection that usually use for outdoor game. 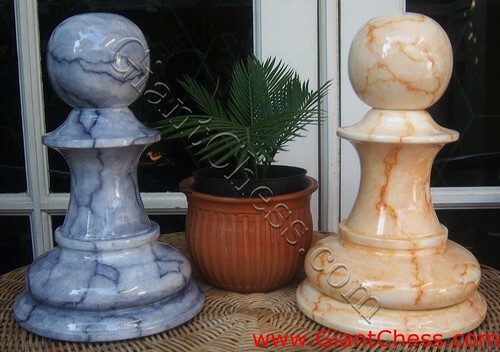 Those pawns pieces are polished in marble look to make it more unique and beautiful. We use best quality Teak wood as its main material in order to make it durable and strong. So it very save for outdoor use and you can left it outdoor for months. Beside, you can also use for garden or patio decoration.